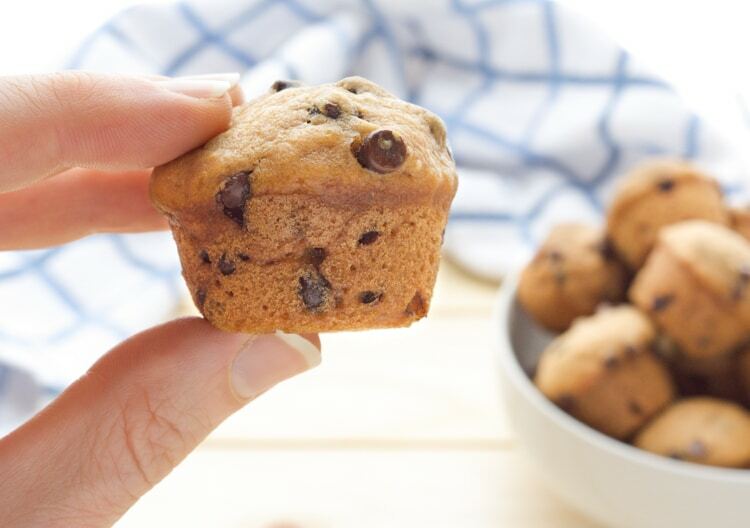 Ready in 20 minutes, these mini Vegan Chocolate Chip Muffins will be a new go-to, pop-able treat! 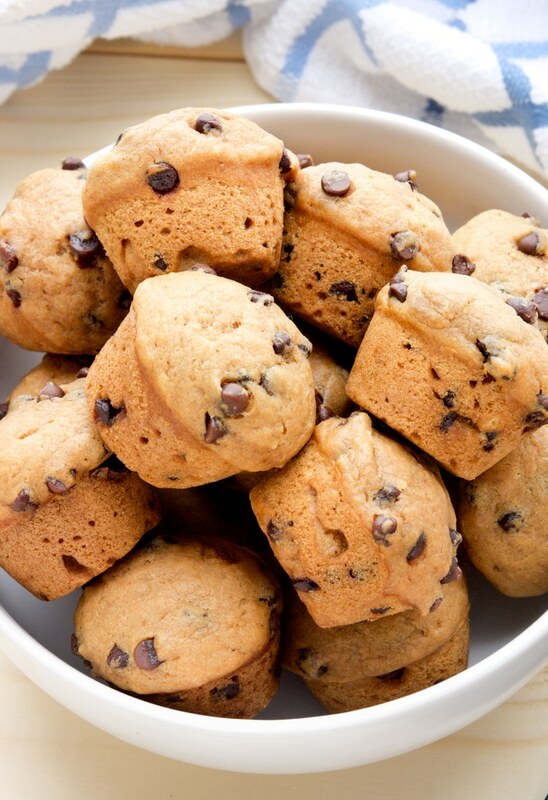 Bursting with chocolate chip cookie flavor, these soft mini muffins are sure to be a hit! They’re great for lunch boxes or as a fun after school snack. Does anyone else have a snack demanding 8 year old? Or is it just me? 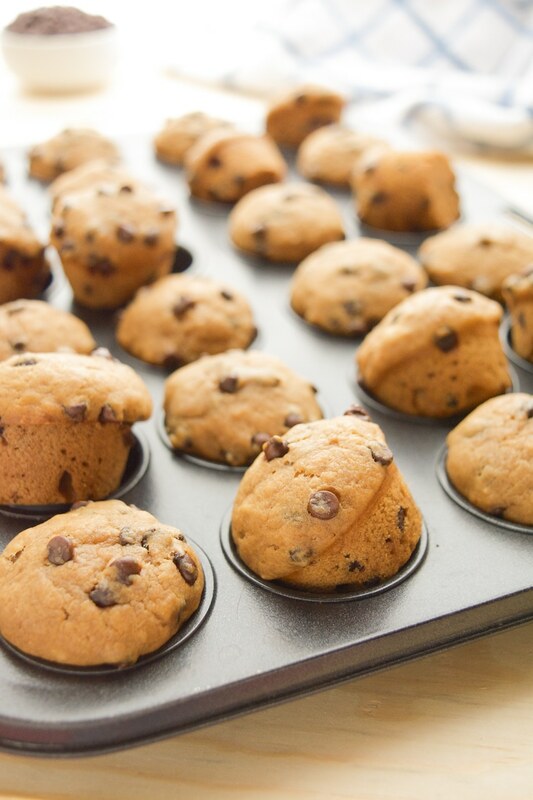 Cute mini muffin pans = Cute Mini Vegan Chocolate Chip Muffins! Of course my daughter was all for the muffins because there were chocolate chips inside and she couldn’t resist cute little muffins. Not to mention the popable factor even had me enticed. Years ago, in my 20’s, I remember snacking on mini muffins. I would buy a box of those individually packaged mini chocolate chip muffins, you know, the chintzy pack of 4. Even though there were only 4 to a pack, I thought they were the best 4 mini muffins ever. Now, I cringe at the ingredients in those little packages. So, in the kitchen we went to make some healthier (than those mini chemical muffins), vegan and chemical-free Chocolate Chip Mini Muffins! Add in the dry ingredients to a large bowl. Then, fold in the wet ingredients. Fill-up the muffin cups and pop those babies in the oven. Now, all that stands between you and those soft little chocolatey muffins is 10 minutes of baking. Sifting the flour and folding in the wet ingredients –rather than mixing–is important to achieve perfect, fluffy pillow top muffins. I’ve seen plenty of over mixed, flat-top muffins around the web (and in my own kitchen). Since I began sifting and folding in the dry ingredients, I’ve been able to achieve soft, fluffy muffins rather than dense, thick muffin pucks. And I know you’ll have the same success, so let’s get baking! For another pop-able, fun kid snacks check out my sweet & salty, soft pretzel bites. 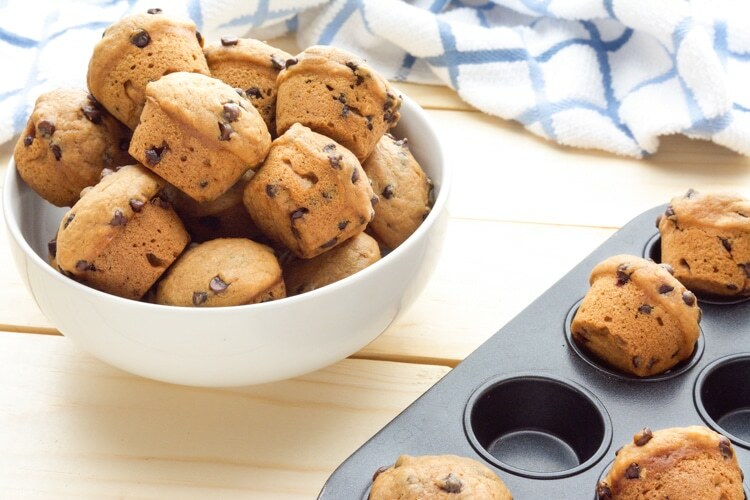 Ready in 20 minutes, these mini Vegan Chocolate Chip Muffins will be a new go-to, pop-able treat! 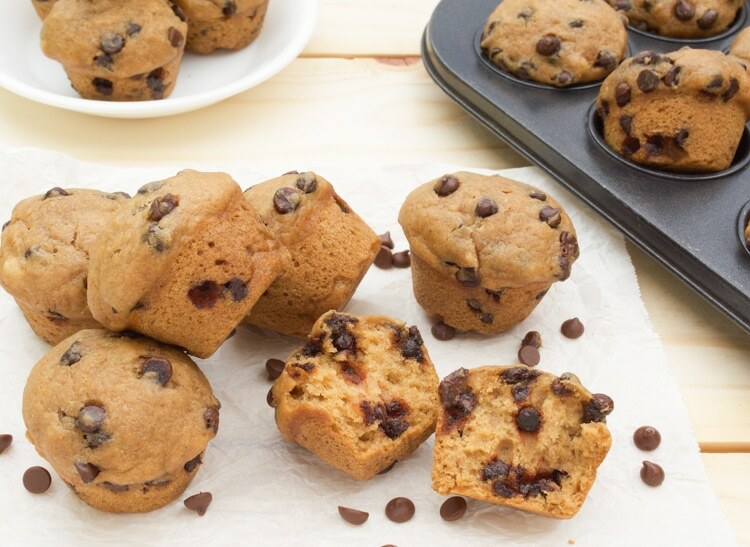 Bursting with chocolate chip cookie flavor, these soft mini muffins are sure to be a hit! They’re great for lunchboxes, or as a fun after school snack. Start by greasing a mini muffin pan with coconut oil and preheating your oven to 375º. Measure the almond milk and stir in the vinegar. Set aside to create a buttermilk. In a large bowl, sift together the flour, baking soda and salt. Now mix in the coconut sugar and chocolate chips. Pour the non-dairy milk/vinegar mix and remaining wet ingredients (oil, vanilla and syrup) into the bowl of dry, then fold them together. Don’t over mix, a few lumps are ok. 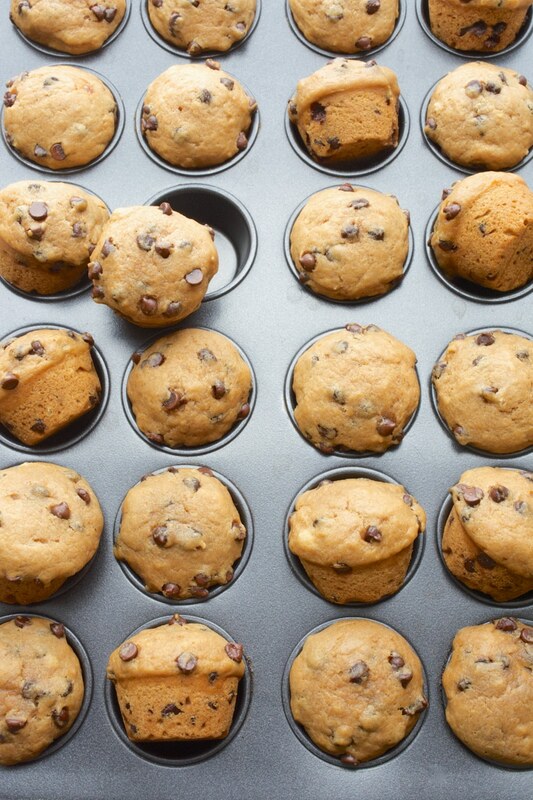 Fill each muffin cup to the top, using up the batter to fill all 24 cups. Bake at 375º for 10-12 min or until toothpick comes out clean of batter. Allow to cool for at least 5 min before transferring to a cooling rack. To store–allow muffins to cool completely, then store in an airtight container for up to 5 days (if they last that long). For sweeter muffins add 2-3 more Tablespoons of maple syrup. For regular sized muffins: bake for 20-22 minutes then test with a toothpick for doneness. I use unsweetened almond milk, but any non-dairy milk should work. My daughter and I made these tonight and they turned out delicious! I stuck exactly to the recipe except my local military commissary doesn’t carry vegan chocolate chips so I used regular mini semi-sweet. We’re calling them ‘nearly vegan’ lol. I will never again buy pre-packaged, full of who-knows-what, muffins. Fantastic recipe, thank you! That's wonderful to hear Leisha! Cleaner options are always better for our children! Can I use whole wheat flour instead of the all-purpose flour? I have only made this recipe using all purpose flour. Whole wheat flour is denser and will affect taste and texture. For a better result I'd suggest using a mix of both flours. Start with 1 cup ap flour and 3/4 cup whole wheat flour. Let me know how it turns out! We make these all the time and love them. Kids gobble them up. Thank you!! My picky preschooler loves these!!! So easy to make and so delicious!!! Thank you! This muffins are amazing! Me and my family loved them. Thank you! Great for snacks although I used regular muffin pan. Had to bake longer due to size. I used Earth Balance in place of coconut oil. I used brown sugar. Easy and delicious. Thanks for a healthy snack. Thank you for such easy recipe! Not only was it straight forward, easy to follow and simple, it turned out perfect - the consistency, amount, they rose beautifully, were easy to remove, and delicious! These came out so fluffy, cute and delicious! I halved the recipe because I only have one mini 12-muffin pan. I need to invest in a second, as my husband and I plowed through these in no time. :). Thanks so much Michelle! 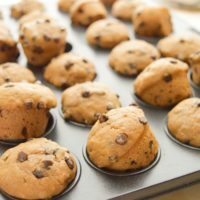 Your comment reminded me of these muffins. I had to go in the kitchen and make a batch, and I'm eating one right now! :) I'd love to hear what recipe you decide to try next. Have a great weekend!! This recipe is perfect...muffins light and taste wonderful. Thank you.